Getting to Myvatn is an adventure in and of itself. Most of the year, the central part of Iceland is relatively impassable. This being the case, most who drive to arrive in Myvatn have traveled hundreds of miles in one direction on the Ring Road to get to this destination. 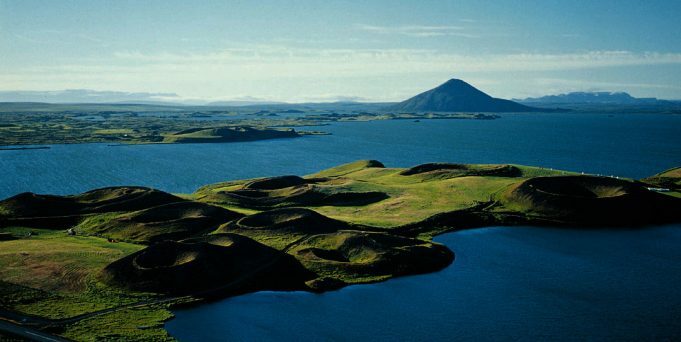 Myvatn’s landscape is unlike any other place in the country. 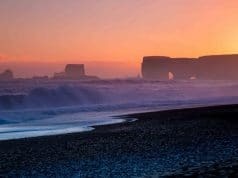 While parts of the south have the majestic black sand beaches, the Westfjords have their jagged cliffs and fjords, and the east has its sharp drop-offs, windy roads and more, this part of north Iceland is a world of its own. The closest thing that travelers have compared Myvatn to is the surreal feeling of being on the surface of Mars. It is truly a world of its own. When approaching from the East, you’ll see as the landscape gets orange-red and you start to climb a large set of hills. Once you crest these hills, you are there. Hverfjall is easily one of the most well known landmarks in the Myvatn area. 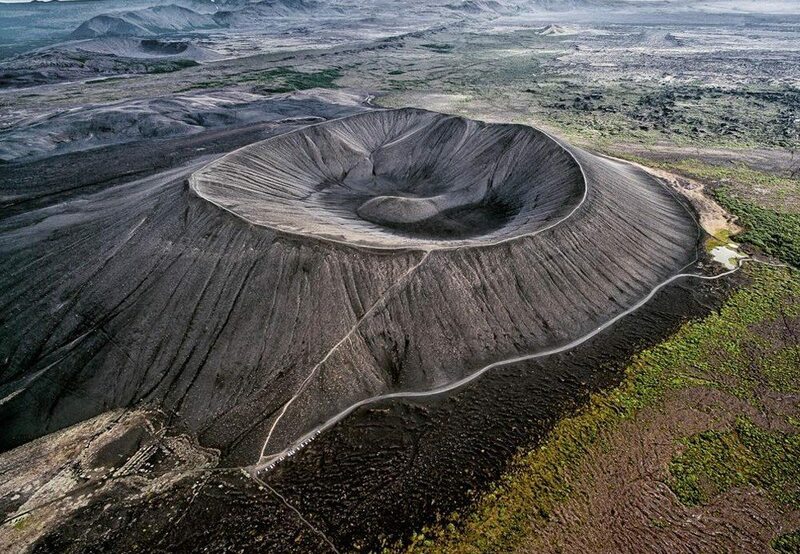 This is one of the largest volcanically-made craters on earth. Unlike most of the massive craters in Iceland that are created due to volcanic activity, Hverfjall is empty inside, allowing visitors to climb around the outside (much like Kerid on the Golden Circle) but also climb into the massive natural wonder and explore (but be warned that it is almost 140 meters deep). Hverfjall was noted at close to 2,700 years old, resulting from a massive volcanic eruption. The crater is close to one kilometer in diameter, and is one of the best preserved circular volcanic craters in the world. 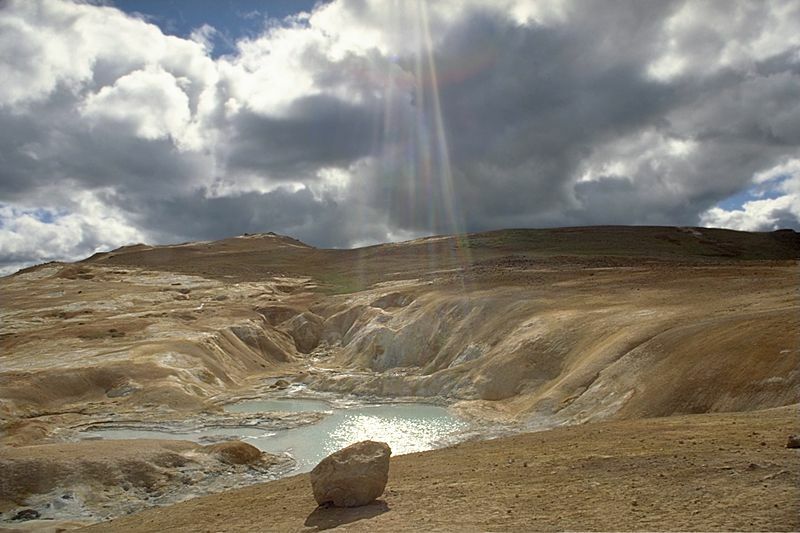 It is part of the Krafla fissure area, which runs all throughout Myvatn. “Dimmuborgir” roughly translates to Dark Castles, which is fitting, as the structures themselves are constructed of very jagged fields of striated lava buildup. This is one of the most striking lava formations in all of Iceland, which is saying something, because there are a lot. 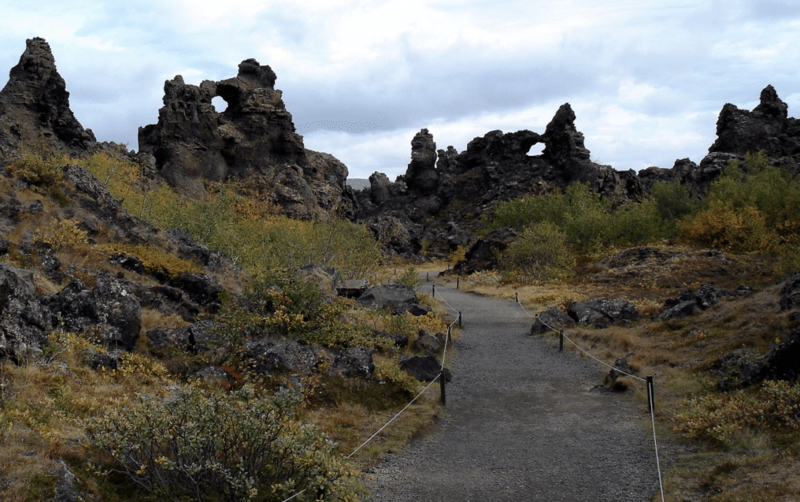 There are many trails winding through the Dimmuborgir area for tourists to explore. These trails are color coded, ensuring that guests and visitors can get around safely, without the threat of getting lost in the lava flow. One of the highest rated areas of Dimmuborgir is Church Circle, which also happens the be the least strenuous of the pathways. The other paths are also not extremely difficult, so it wouldn’t be a bother to explore them all. People believe that these unique pillars and crags were created over 2,000 years ago, when lava flowed through the area after a massive volcanic eruption. Leirhnjukur is a massive geothermal area, created partially from lava flow that is still steaming, even after over thirty years since the most recent volcanic event in the Myvatn area. When Leirhnjukur originally formed, it spewed lava for two years straight. Upon entering, you’ll feel a sense of danger. Partially due to the fact that the lava is still steaming to this day. In the background of this area, you can see Krafla and the Viti Crater. It is vital to ensure that you don’t spend the entire time staring off into the distance, though. There are marked paths that need to be followed, to ensure that you don’t melt your shoes walking into an area with steaming vents or bubbling mud pots. Lofthellir, close to Myvatn, is one of the most awe-inspiring things you may ever see. The lava cave is the perfect blend of the mystical Land of Fire and Ice that is Iceland. Lofthellir cave tours run throughout the day most of the year while the Ring Road is passable. A guided tour is a requirement, much like the Vatnshellir Cave, as the lava cave is on private property. 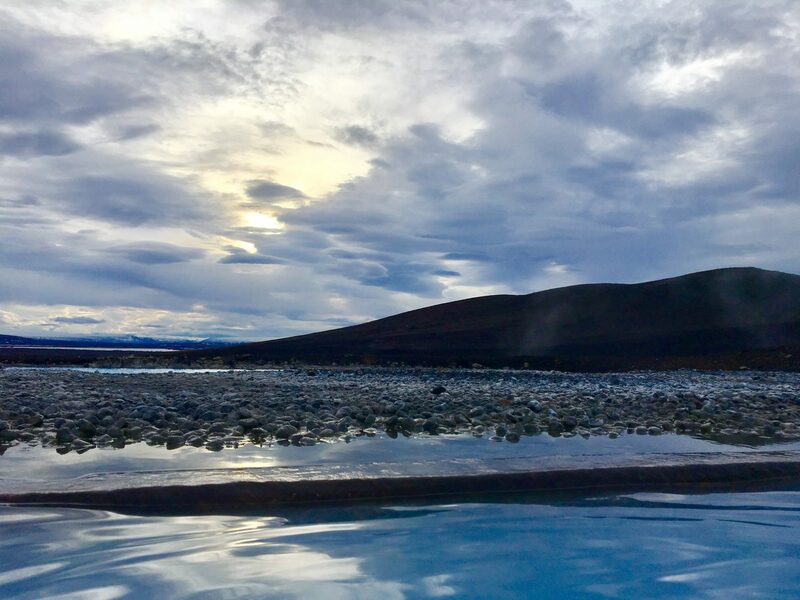 The tour is a 45-minute trip with a four wheel drive vehicle, with an additional 20 minutes of walking across a beautiful lava field in order to reach the cave. You should dress warmly if you are heading here, and be ready to move around in some very tight spaces. 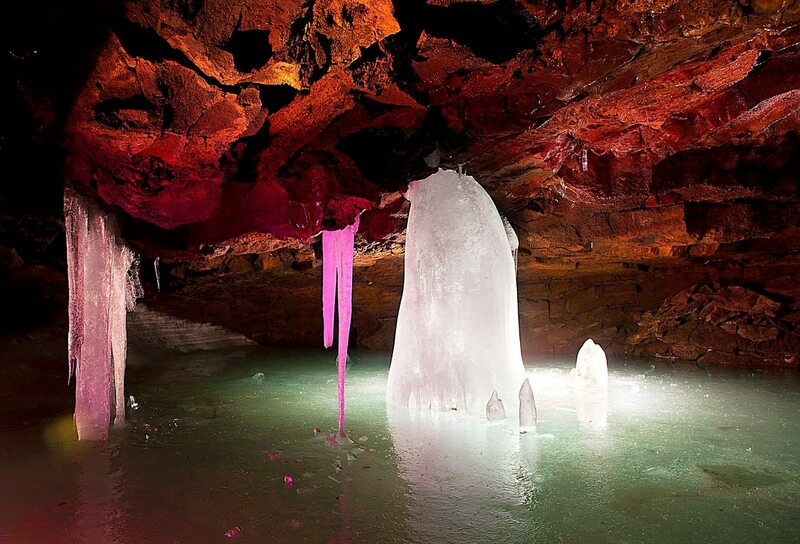 At least one hour is spent inside the cave, observing this remarkable and some say unbelievable natural phenomenon. The biggest draw to this cave are the massive, floor to ceiling icicles that spike through the cave walls. 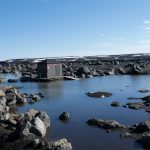 Remember earlier in this article where Myvatn was described as being on the surface of Mars at times? This is one of those times. Hverir is otherworldly. Some will not be enticed due to the incredibly strong sulfur smell. It’s a light smell in most parts of Myvatn, but in Hverir it truly comes out to play. Regardless, this is an incredibly popular landmark for tourists who want the true landscape-changing wonder of northern Iceland. 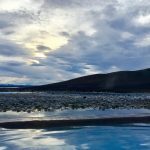 if you’re coming to Hverir from adjacent Mývatn, behind Námaskarð pass, the large geothermal field of Hverir is a unique wasteland where large blue-purple pools of boiling mud, hot springs and hissing volcanic chimneys give life to the ground. There are an abundance of steaming vents, mud cauldrons, piping fumaroles, and gorgeous mineral deposits in Hverir. You will notice that the local parks department has roped off the pathways to help people stay safe as they walk through this stunning landmark. Much like Leirhnjukur, this is in place to ensure that you don’t melt your shoes walking into an area with steaming vents or bubbling mud pots. 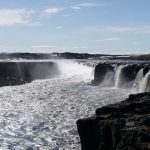 Dettifoss is a good 45 minute drive away from Myvatn, but can still be classified as being in that general area, as there are no other towns of worth between the two landmarks. 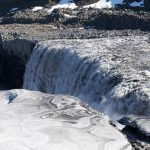 Driving to Dettifoss provides stunning landscapes, and you will pass by or through a few of the other attractions in this article. When you arrive, you’ll notice a nicely paved parking area. 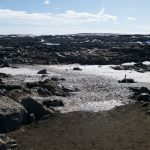 After stopping at an overlook and utilizing our 4G card to research the best way to get to Dettifoss, we settled on Road 862 instead of the far-rougher (but better viewpoint) Road 864. Road 864 had been closed due to traveling hazards and icy conditions. It was a long drive to Dettifoss from the Ring Road, and when we arrived at the spacious parking area, there were very few others there. The image is what the flooded parking area looked like, the result of melted snow over the previous few weeks. 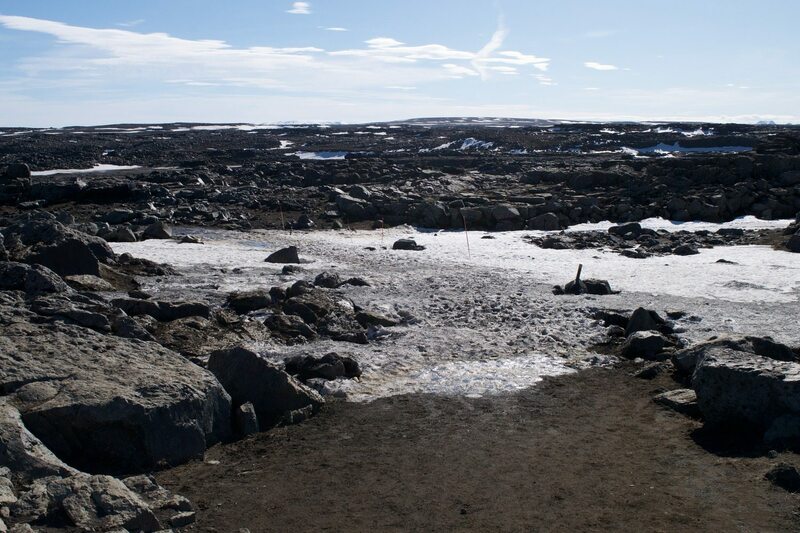 The pathway to Dettifoss and Selfoss were in incredibly rough condition due to the snow and ice melt, and were icy, muddy, and slippery the entire mile-plus walk. The trails were marked with strangely-stuck poles like the ones seen above. Pathways off limits were marked with crossed poles, yet a park ranger informed us to take those paths anyway, as the marked paths were in bad condition. Eventually we reached Dettifoss. We could hear the roaring waterfall from quite far away. 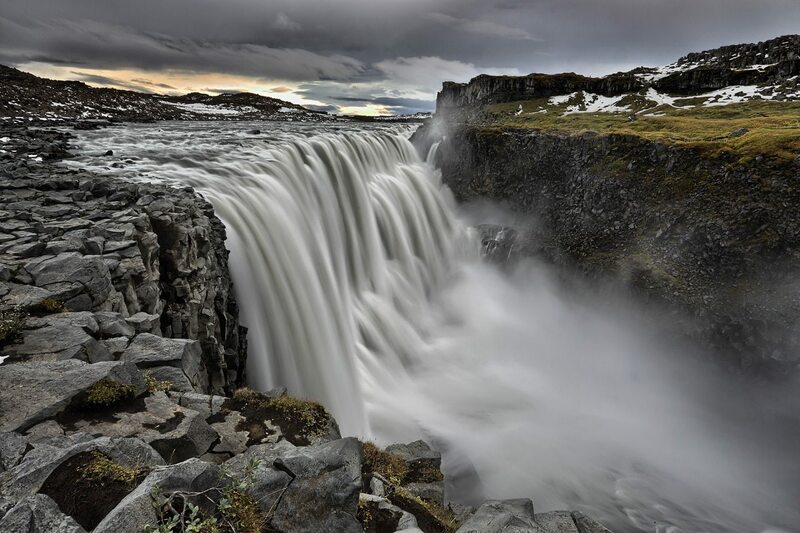 Dettifoss is the most voluminous waterfall in Europe, and number eight on World of Waterfalls’ top 10 waterfalls in the world. The beautiful, fast-flowing grey rapids were framed perfectly by the jagged cliff face in the background and melting ice in the foreground. Sadly, traveling further past the overlook for a better vantage point was off limits and completely cordoned off. 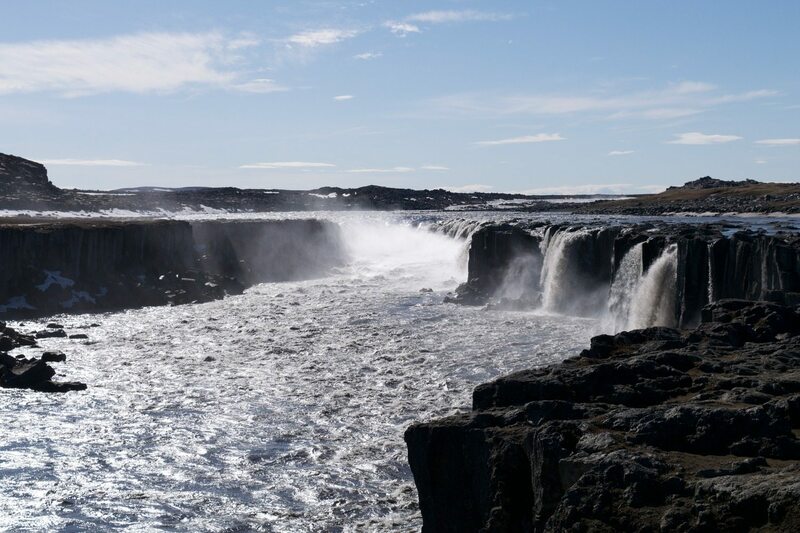 At this point, we backtracked through the melting ice 0.6 miles to Selfoss, a beautiful yet widely overlooked wide-flow waterfall slightly further upstream from Dettifoss. 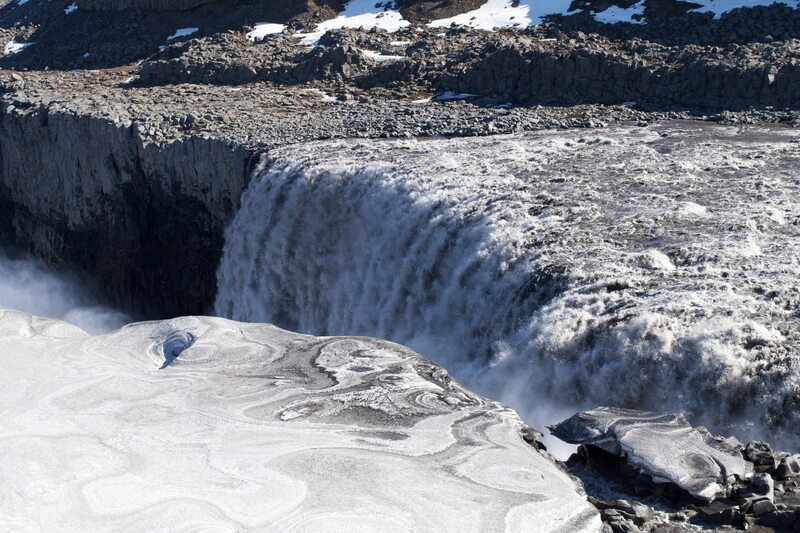 Similar in shape to Godafoss, Selfoss was a long series of cascades on both sides of the river. The area where this photo was taken is a nice, flat area, perfect for a break or a picnic with an incredible view. We sat for a little while and then headed back to the car. 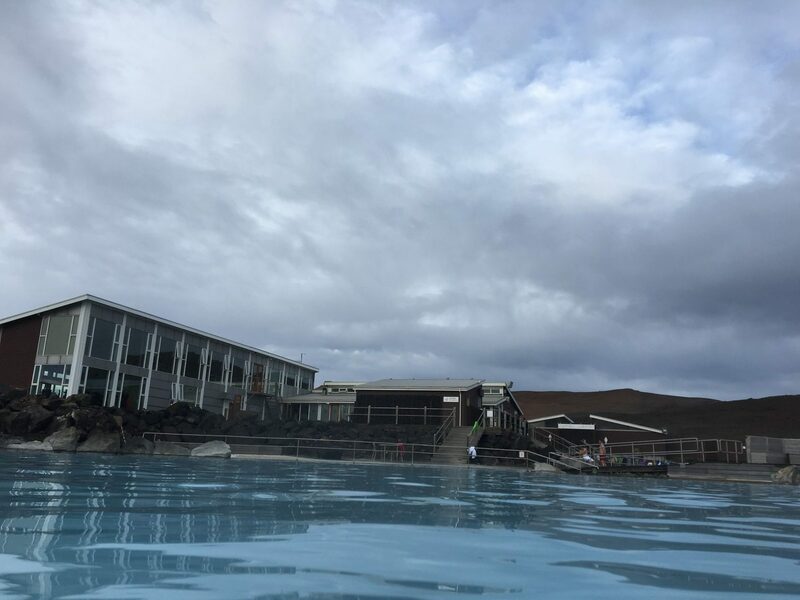 While there are so many places to visit in nature in the Myvatn area, you may want to enjoy an indoor adventure while you are here. This museum exists in a lakeside building that has a traditional but modern look to it. People who love birds and birdwatching will especially find this museum a fascinating location. 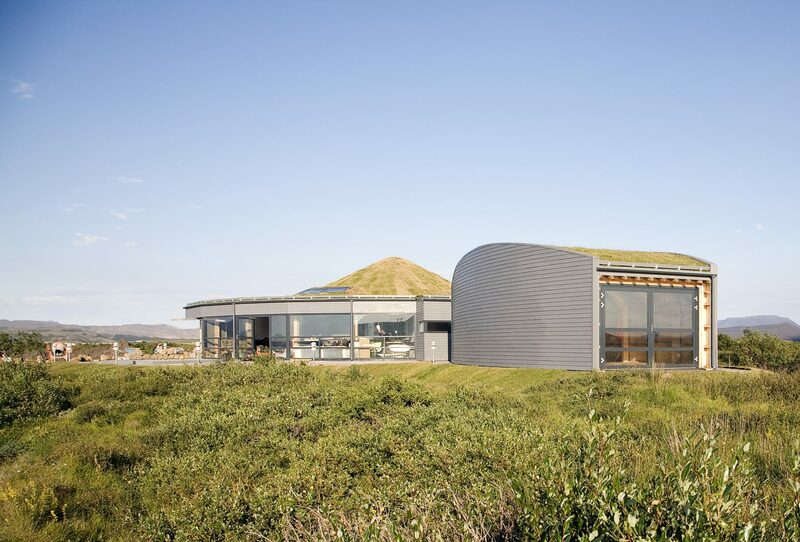 The bird museum is located on the farm Ytri-Neslönd beside Lake Myvatn. 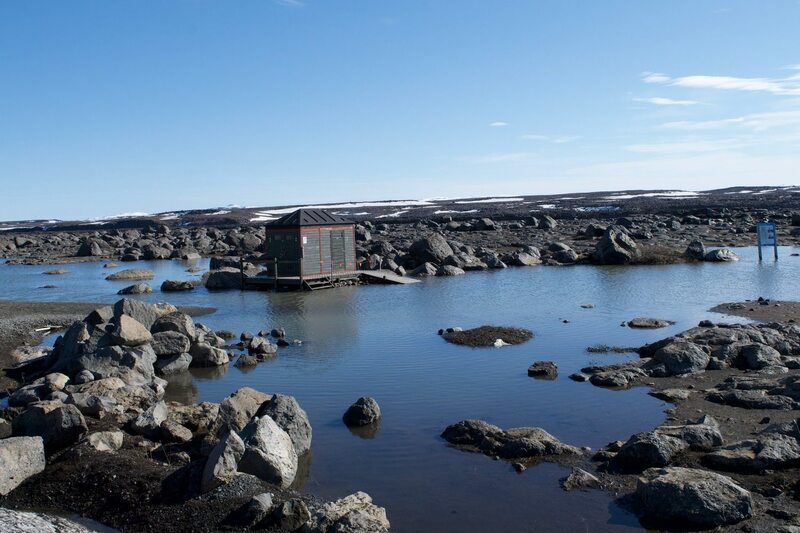 It was established following the pioneering work of Sigurgeir Stefansson who lived at the farm. There are over 180 taxidermic birds from across the globe, including nearly every species that exists within Iceland. This stunning location also offers aesthetic appeal in the building that adds to the experience while you take in the sights and sounds this museum has to offer. This is widely considered to be the largest and most diverse collection of bird taxidermy in all of Iceland. 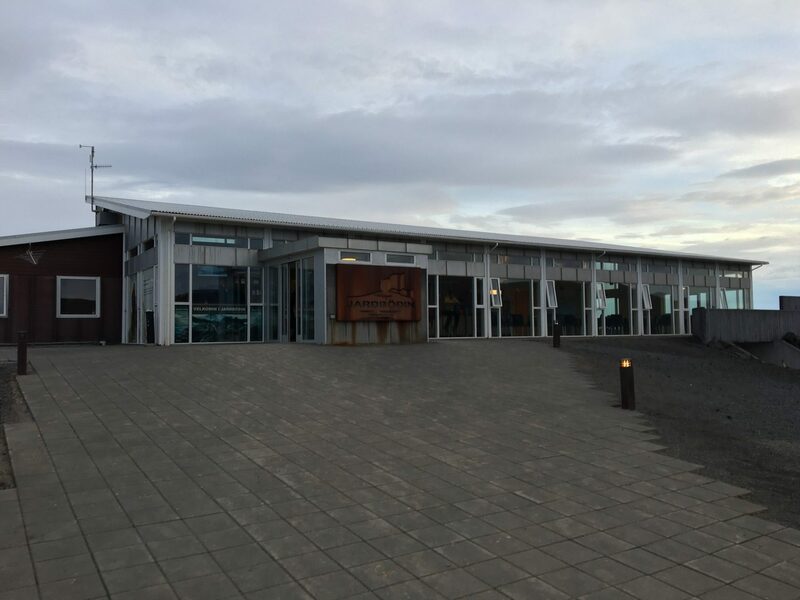 Additionally, much of the bird life of Lake Mývatn can be viewed directly in front of the museum. You can watch birds on the lake whilst also enjoying some local refreshments. We went inside and checked in, then received our accessories and changed into our bathing suits, showering off after changing in the open locker room setting. I got confused as to how to exit, and ended up missing the sign to get to the bath area, walking back out into the lobby in my bathing suit. A kind-hearted employee guided me in the right direction. The baths were a beautiful, deep blue and incredibly warm. The bathing area to the right was slightly cooler than the bath across the bridge, which explained the lack of fellow bathers in this area. The water is blue from sulfur, so expect a strange, egg-like smell to persist. You’ll get used to it eventually. Make sure you keep your key on your wrist at all times as well, as this is the only way to get back into your locker after you are done! The view from the baths was stunning, and unlike the Blue Lagoon, these were nature-made, with a rocky bottom. While the baths were relatively busy, there was still ample room to swim about and relax. A sauna provided natural steam soaks as well, although I lasted about three minutes inside before I thought I was going to stop breathing. 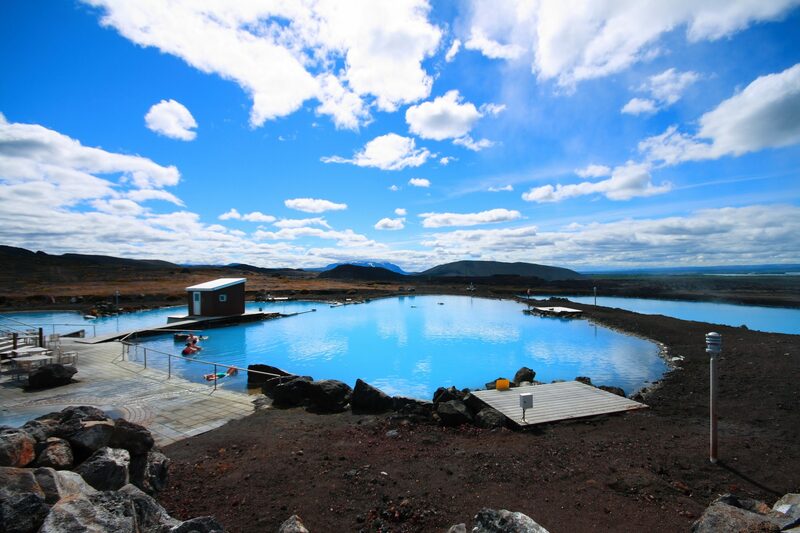 Also in Myvatn or the general area are such places as: Grjotagja, the Krafla Geothermal Power Station, the Viti Crater, and the Bjarnarflag Geothermal Power Plant. And this is still only scratching the surface of this stunning visual area. 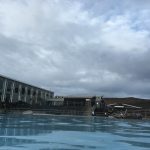 Myvatn is a beautiful location that has so much to offer within the area and around it. This is a perfect spot for nature lovers to venture out into. 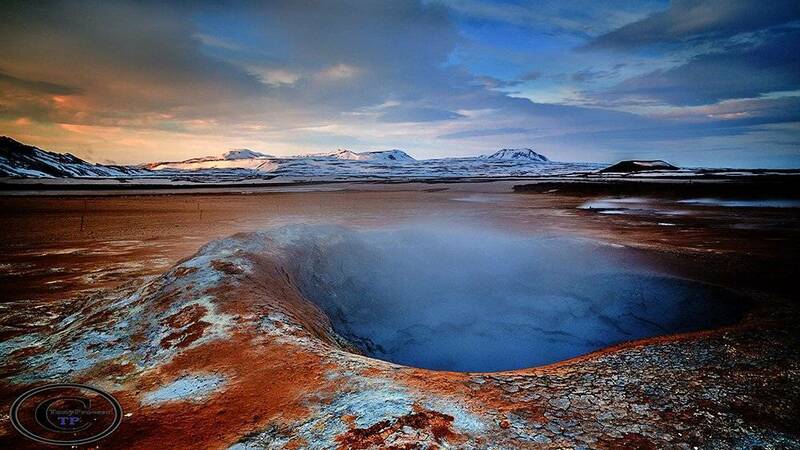 Iceland is one of the most breathtaking countries in the world. 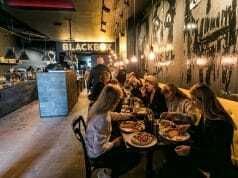 Knowing the best places to check out while you are visiting this country can help you to maximize your time when you are here. 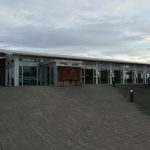 These landmarks are some of the best that the Myvatn area has to offer. 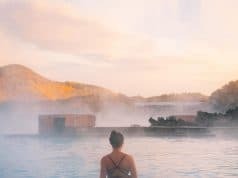 Whether you visit some of them or all of them, you are truly going to have a magical experience when visiting Myvatn in northern Iceland.